A tax-savvy way to improve your real estate situation is to swap one property for a new one. Called a 1031 exchange, referring to its section of the tax code, this works so long as you are switching business properties. Personal residences aren't eligible. While 1031 exchanges are often used by big commercial real estate operators, there's nothing stopping you from using the strategy for much smaller-scale holdings. The maneuver defers capital gains taxes, perhaps forever. This takes some planning. For instance, say you have a vacation house and would like to exchange it for a property in a location that is closer to your residence. You must rent the original vacation place out for at least 14 days per year for two successive years, and in the eyes of the IRS, you have a business asset. The only caveat is that you must continue to rent out the new vacation house for 14 days over the next two back-to-back years. A couple of more requirements: First, you must identify the substitute property within 45 days of selling the old real estate. Second, you need to buy the new property within 180 days of your sale. The nice thing about 1031 exchanges is that you aren't confined to the exact same type of property. So, you can swap a condominium for a farm, or a house for a marina — as long as it's a business or investment property. You'll need expert advice on this issue. The December 2017 tax-code rewrite barred applying Section 1031 to make tax-free exchanges of collectibles but left intact tax-free exchanges for business- or investment-purpose real estate. Federal capital gains taxes now are 15% (for income of $38,601 to $425,800) or 20% (for $425,801 or more). You can postpone paying taxes for the rest of your life. And your heirs benefit, too. When they inherit the property, they get a "stepped-up basis." This means the property is valued at the market rate at the time of your death. So, the taxable amount adjusts upward. If your heirs turn around and sell it right away, they will owe little or nothing. The tax liability on the property is erased. Of course, the swap must be a sensible business deal. Getting a tax-free sale of a profitable strip mall to buy an apartment building that has trouble keeping tenants, for example, would be a bad outcome. Accounting the value of a property properly is another important consideration, separating a capital investment in new appliances, for instance, from the fair value of the property. Keeping Uncle Sam's hands off the proceeds of a sale of real estate is an essential part of financial planning for owners of real estate for business, investment, or rental purposes, as well as those who rent out a vacation home as required under federal rules. Strict timing limitations are required in a 1031 exchange. 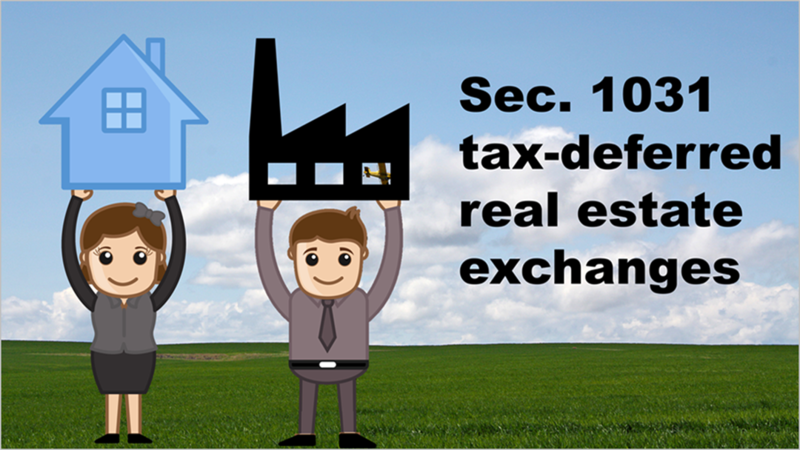 If a 1031 exchange is not properly constructed and executed in a timely manner, then an investor could lose all tax benefits of the transaction, including depreciation recapture. In addition, the property you sell must be a replaced with a like-kind property, and a Qualified Intermediary, as an independent third party, is needed to facilitate a 1031 exchange transaction and hold the funds on behalf of the investor. Investors must also be leery of investments in private offerings created to sell 1031 exchange transactions. These are often illiquid investments, and do not offer guarantees of income or that your investment objectives will be met. They may be speculative, and you could lose some, or all, of your principal investment. This is neither an offer to sell nor a solicitation to buy any security, which may be made only in an official offering memorandum. Investors should read any offering memorandum and review any risks associated. This article does not include all material information to determine whether to conduct a 1031 exchange. 1031 exchange opportunities are available only to accredited investors. Investors must be qualified prior to any discussion of a current or contemplated offering.